Combustion air and flue gas damper drives fill a critical role in the operation of fuel fired equipment, helping to meet safety, regulatory, and efficiency performance criteria with a predictable degree of reliability. It is essential to deploy the best drive technology for each application to maximize combustion efficiency, minimize emissions and reduce installation costs. Damper drives can be one of three types: pneumatic, electric, or electro-hydraulic. Pneumatic - These damper operators employ compressed air as the motive force when positioning a connected damper. Electric - These operators rely on electric power to operate a drive mechanism, commonly a motor and gear assembly for damper positioning. 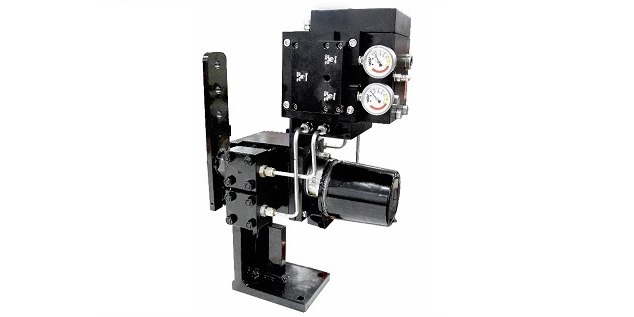 Electro-hydraulic - Damper operators of this type combine an electrically operated pump that is precisely controlled. The pump moves a hydraulic fluid through a connected mechanism, such as a dual acting piston, to set the damper position. A very important part of product selection is determination of the damper torque and sizing requirements. Actuator torque should be selected to provide the maximum torque required to operate the damper as well as to provide headroom to compensate for degradation over the life of the damper. Actuators should be evaluated for damper blade movement in both directions, at the beginning of blade movement, and while stroking through the full cycle of movement. Reduced emissions, lower fuel consumption and improved boiler draft control. Information on one possible solution is provided below. For more information, share your project requirements and challenges with application specialists, combining your own knowledge and experience with their product application expertise to develop an effective solution. Electro-Hydraulic Damper Drives for Combustion Control from Classic Controls, Inc.